The Huawei Mate 9 – which has been the subject of some rumors and leaks in the past few weeks – will be officially released on November 8, according to a new rumor out of the company’s home country of China. The rumor also reveals pricing information for the various variants of the handset. It says that the 4GB RAM + 64GB ROM variant will carry a price tag of RMB 3,199 ($475) or RMB 3,399 ($505), depending on whether it’s a Carrier Edition or a phone which supports all Chinese networks. 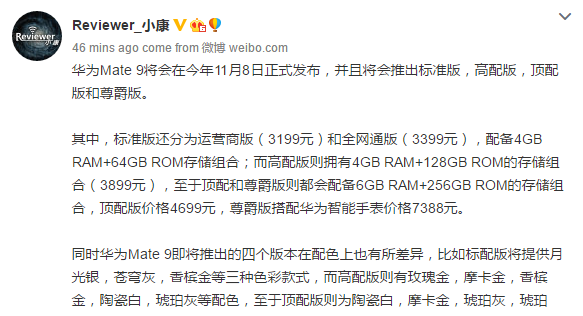 Then there will be a 4GB/128GB model that will cost RMB 3,899 ($580). And finally, the top model with 6GB RAM and 256GB storage will set you back RMB 4,699 ($700). As for other key specs, previous rumors have revealed a Kirin 960 chipset, 6-inch full HD display, and dual 20MP cameras (certified by Leica).